July 9, 2013. Watauga County roadways are experiencing hundreds of major road problems due to the flooding and extremely high volume of rain that the High Country has experienced so far this month. Complaints of sinkholes, broken pavement, giant potholes and eroded drainage systems have poured into the North Carolina Department of Transportation, which is working fervently to correct all reported problems to make roadways safe for drivers. 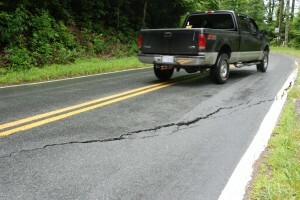 Just one example of the broken pavement problems rampant in Watauga County. Photo by Ken Ketchie. “Here in Watauga County, there has been almost $750,000 in damage to the state roadways, which doesn’t include problems with commercial centers like Tanger Outlets,” said Kevin Whittington, highway maintenance engineer with the Department of Transportation in Watauga County. Most roadway issues due to flooding occur when culverts underneath roadways fail, allowing water to flow around pipes and erode the material. This causes roadways to sag, crack and even open up. “We have had a lot of shoulders slough off and set down, lots of drainage overflows, stopped up pipes and slope failures. Some roads are closed or semi-closed because of the flooding still,” Whittington said. One major hazard is the N.C. 88 area which will be closed from 7 a.m. until 10 p.m. on Thursday, so the workers can replace a decayed drainage pipe underneath the roadway and replace fill material that has eroded out. There will be a 1.5 mile detour put in place to keep traffic disruptions at a minimum. The NCDOT has been slammed with calls from various pipe stoppages, muddy conditions on unpaved roads and road hazards. A lot of flooding occurs upstream, which will cause the high volumes of water to flow down, carrying with it debris that can clog up drainage systems. Debris like logs, branches and even children’s toys fill up drainage systems and leave nowhere for the water to go. Making predictions about road conditions is difficult, as many hazards will not show up for several weeks. “We feel comfortable that everything is safe and secure and if it isn’t we will make it safe and secure,” Whittington said. Please report any road damages, sinkholes, potholes and other road hazards by calling 828-265-5378.